Welcome to the Oh She Glows Cookbook Newsletter! Hi friends, Angela here. Thank you for subscribing! I figured it was about time that I sent out my very first newsletter. Yes, this is my first newsletter after 5 and 1/2 years of blogging. Oh boy. Better late than never, right? I told you I wouldn’t spam you, and I kept my word. Now, if I can just figure out this newsletter plug-in and make it look half decent, it will be a miracle! Hopefully the wait was worth it because I have a fun prize package to giveaway today, as well as some juicy details about a bonus recipe bundle that I have coming out soon! 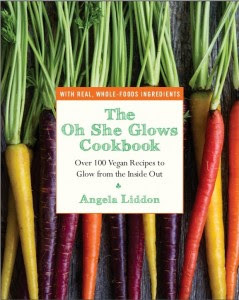 As many of you know, The Oh She Glows Cookbook will be released on March 4th 2014 all across North America! After spending over 2 years developing the recipes, writing, and shooting photography for the book, I can see the light at the end of the tunnel. Best of all you don’t have to wait much longer to get this book in your hot little hands. I poured my heart and soul into it and I really hope it’s a staple in your kitchen for years to come. The cookbook features over 100 of my favourite recipes, including around 75 new recipes never before seen on the blog, as well as around 25 revamped reader favourite recipes. There are over 100 full-colour photographs. There will be allergy info for each recipe (such as gluten-free, grain-free, nut-free, soy-free, etc…and of course, all are 100% vegan) with many substitution options, including over 85 gluten-free recipes in the book. I tested, and tested, and tested again, as d id my amazing recipe testers. I tell you we ate really well in 2012 and 2013! Only the best of the best recipes made the cut for this book. The book will also feature a beautiful, high-quality interior and exterior paper stock with two different covers depending on whether you purchase the Canadian edition (published through Penguin) or the US edition (published through Avery). The content of the book is the same though, so not to worry! The Canadian cover features my parfait recipe, while the US cover features a shot of rainbow carrots. Thanks to your pre-orders over the past several months, The Oh She Glows Cookbook was Indigo/Chapters most pre-ordered book of 2013, as well as their top pick for 2014. Excuse me while I pee my pants. It also hit #1 on Amazon.ca Bestseller list on a few occasions. I am totally pinching myself and I have you all to thank for your support. When I developed the recipes for the The Oh She Glows Cookbook there were a handful of recipes that simply didn’t fit within the page limits, but they were too good to forget about. What’s a girl to do? Well, I decided to test and photograph the recipes again and throw in some new ones for a bonus recipe e-bundle! Yes, that’s right a bonus mini cookbook. Just like in the actual cookbook, I’ve included allergy information for each recipe and also recipe modifications when applicable. I worked very hard over the past couple of months to make this recipe bundle come to life. I just saw the design today and it looks beautiful! This bonus recipe bundle is FREE for all pre-order customers. When the recipe bundle is ready I will announce it on Oh She Glows (it should be ready by end of January) and all you have to do is email your receipt to the specified email address (details coming soon). You will be sent an e-copy of the recipe bundle right away! Easy as that. Be sure to save your receipt. Right now the recipe bundle is going through the editing process, but my publisher expects it to be ready no later than the end of January. Stay tuned for more details. Last but not least, congrats to Kelly Garbato for winning a bag of Sunwarrior protein powder and a $50 gift card to Amazon! Kelly, you were selected randomly from the list of newsletter subscribers. Please email [email protected] with your mailing address and I’ll have this sent out to you ASAP! Just pre-ordered my book and am counting down the days to March 4!! My husband laughs becuase I am so excited about getting a cookbook in the mail!! haha aww thank you Heather! That is so sweet :) I hope you enjoy it! Just pre-ordered the book and am so excited! Is there any info yet on getting the bonus recipe bundle? 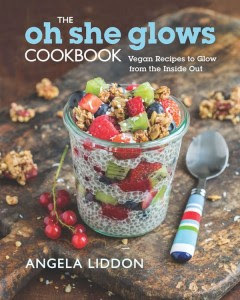 Hey Carla, Yes you can find that info here: http://ohsheglows.com/2014/01/28/the-bonus-recipe-bundle-is-here/ enjoy and thanks for pre-ordering! just read about your cookbook and just put it in my shopping cart on amazon….SO EXCITED!!! as a colon cancer survivor, sometimes i end up not eating much of anything for fear of eating something bad for me….but this doesn’t work when feeding a family of four, so i am in dire need of a good cookbook! question: is the recipe bundle going to be available to those of us who didn’t pre-order (because we didn’t know about your book! )?